Ready to try something new? Lets do this! Hey there Part and Parcel Mystery Sewists! If you are just joining us, WELCOME! You'll want to get the Introduction and strip cutting instructions HERE. Give yourself extra brownie points (or Brownies!) 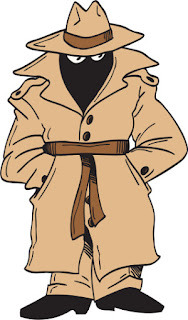 if you sew your mystery quilt while wearing a trench coat. Update: I updated the fabric requirements for the sew-along. You'll want to head to the intro post for better instructions. Basically I just added about 1/4 yard to all the fabrics to allow for squaring and possible oopsies. All seams should be a scant 1/4". That means 1 or 2 threads short of 1/4" to allow for the thickness of the fabric when folded. If you find your units are not ending the right size. Check your seam allowance for accuracy. Here's a tutorial. Cut larger pieces first for best use of fabric. Return remaining fabric to the strip stash. Let's jump right on in. 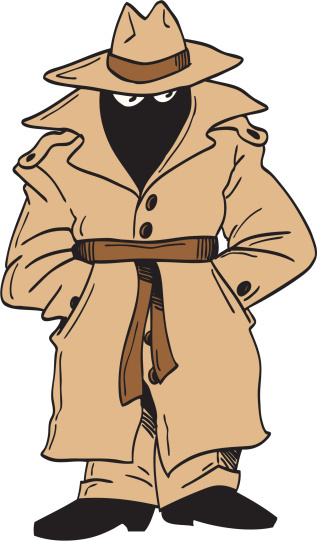 Trench Coat and all! One change: I found as I was working, the abbreviations (NML, CD etc), were confusing. I'm not going to use them anymore and I've omitted them. Just assign your fabrics a number 1-7. I used 1-4 for my neutrals from lightest to darkest, and 5-7 for my colors lightest darkest. Pull the following strips from the strip stash. Fab 3: 2 @ 4 1/2"
Fab 4: 1 @ 6 1/2"
Fab 5: 1 @ 4 1/2"
Fab 6: 2 @ 2 1/2"
Fab 7: 2 @ 2 1/2"
If all has gone well you have a lovely stack of 23 multi-sized rectangles and strips. This pattern has many framed squares and rectangles. Your pieces are sized to sew the side sashes first then the top and bottom, unless otherwise specified. You'll always know which side is UP by the direction of the seams. Sewing with the sashes toward the feed dogs may keep your units more square, and will give more control over the direction of your seams. Press all seams to the outside, unless specified. Never sew over an unpressed seam. Section 1 has 3 blocks. 4 1/2" x 6 1/2" Fab 5 rectangles. Sew a 2 1/2" x 8 1/2" Fab 7 strip between the two units. Then sew the remaining 2 - 2 1/2" x 8 1/2" strips to the top and bottom of the block. Block 1 should measure 8 1/2" wide x 18 1/2" tall. 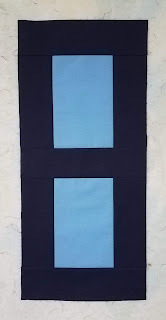 Sew the 2 - 4 1/2" x 10 1/2" Fab 3 strips to the sides of the 10 1/2" Fab 2 square. Sew 2 - 4 1/2" x 18 1/2 Fab 3 strips to the top and bottom of the unit. Block 2 should measure 18 1/2" square. 2 1/2" x 6 1/2" Fab 6 strips. 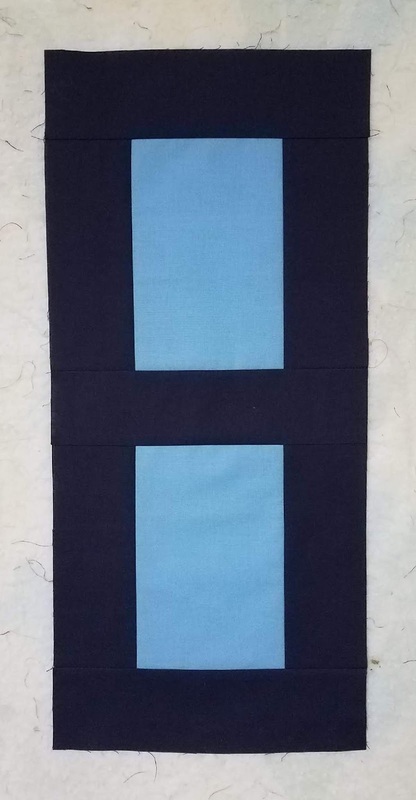 Sew a strip to the left side of each square. 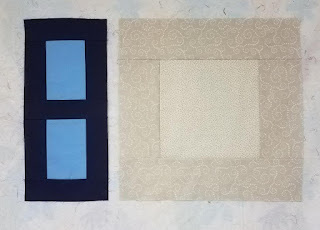 Then sew a strip (with it's accompanying square) to the right side of each square. You should now have a strip of alternating strips and squares. 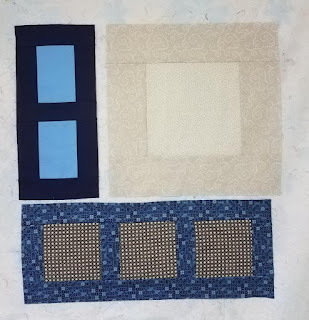 Sew the 2 1/2" x 26 1/2" Fab 6 strips to the top and bottom of the block. Block 3 should measure 26 1/2" wide x 10 1/2" tall. 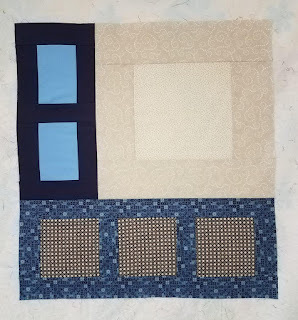 Sew Block 1 to the left side of Block 2. 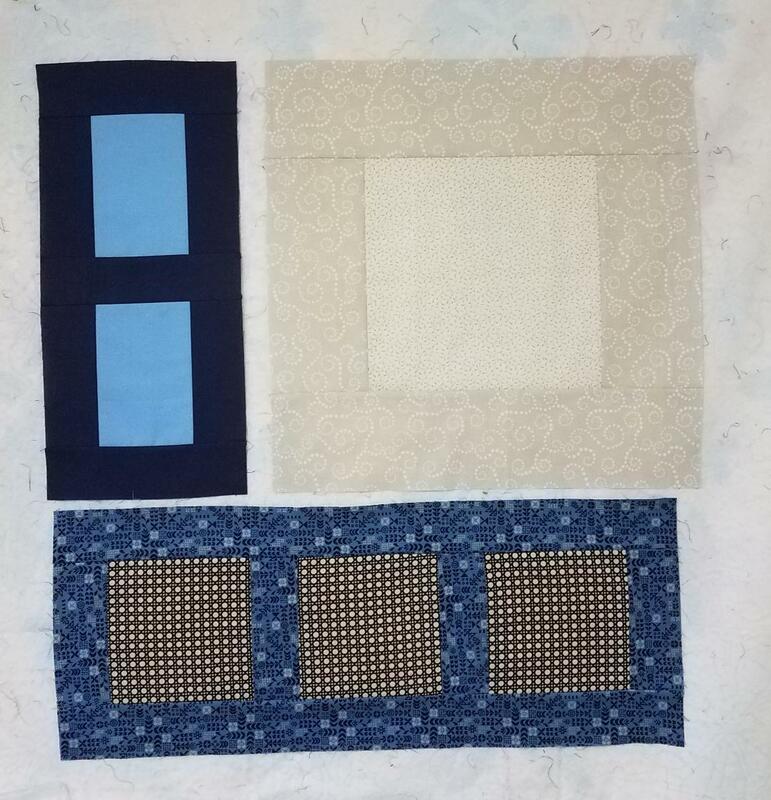 Sew Block 3 to the bottom of Block 1 and Block 2. Section 1 should now measure 26 1/2" wide x 28 1/2" tall. Please leave comments or questions in the comment section below. Don't forget to invite your friends and click the Followers Box on the right. Remember the pattern is copyrighted. But YES! share the link to SeamlessPiecing.com. You can leave comments or photo on Facebook and follow us on Pinterest. I look forward to next week's "something fun". We'll get back the the Part and Parcel Mystery Sew-along in two weeks. Copyright RBoothe 2018. Awesome Inc. theme. Powered by Blogger.